In a medium bowl, cream together the butter and brown sugar until smooth. Stir in the eggs, vanilla and honey. Sift together the flour, baking soda and cinnamon, gradually stir into the creamed mixture. Finally, stir in the rolled oats and raisins. Drop dough by rounded teaspoonfuls onto unprepared cookie sheets. Bake for 10 to 15 minutes in the preheated oven, until cookies start to brown. Remove from baking sheets to cool on wire racks. the trick to these cookies is to not overbake them! they are so moist chewy and delicious. I used Sun Maid baking raisins...no soaking or boiling necessary. i am in love! 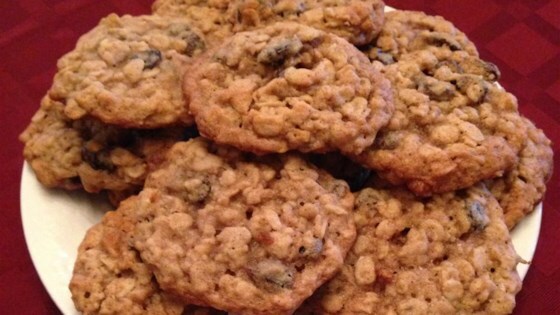 best oatmeal cookie recipe i have ever made. i used whole wheat flour, and added some chocolate chips and nutmeg. great cookies!